Towing charges for automobiles and SUV’s can vary greatly. In the Oswego, IL area, charges may start at $65 for a local tow and increase upwards of $100 plus a mileage charge. There may be an additional labor charge if necessary for your situation. One passenger can usually ride with the tow truck driver to the same destination as the vehicle free of charge. Have you ever had to have your vehicle towed? Did you know what to do or who to call for help? It can be overwhelming if you have never had this experience, so please keep reading! 1) Do you have a relationship with a local towing company? If so, input their phone number into your cell phone. Do they offer 24 hour towing, 365 days a year? 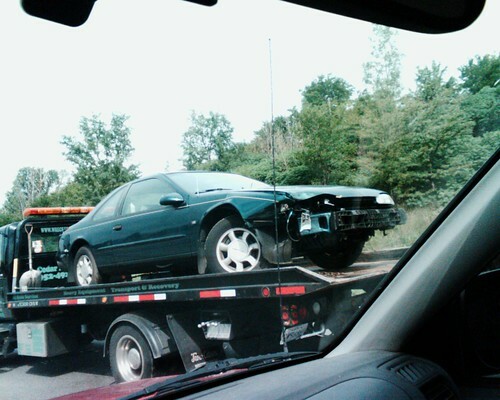 2) Have an emergency fund to pay for the towing charge. Some companies will only accept cash, some will accept credit/debit cards. Checks are rarely accepted. 3) Are you enrolled in AAA (or similar) towing service? Is your membership card easily accessible with the customer service telephone number? Have you familiarized yourself with their process? Some companies require the customer to pay upfront and then they reimburse you later. Be informed so you will not have unexpected expenses. 1) Put on your hazard lights. If possible, pull the car off to the side of the road so you aren’t blocking traffic. If you are blocking traffic, call 911 to report it and ask for help. They will send the police and contact a tow truck for you. 2) Call a tow company. They will ask for the following information: Your name, location of the vehicle, type of vehicle (including color and license plate), a cell phone number, what the concern is (stopped running, flat tire, etc) and the address of where you want the vehicle towed to. If your vehicle is front wheel/all wheel drive or is heavily loaded, make sure and tell them so they can dispatch the correct type of tow truck. 3) You should ask how long you can expect to wait for the truck to arrive. Tell them if you will be with the vehicle or not and if you will need to ride with the driver. You may ask for a price estimate. 4) If you need to leave the vehicle: put the keys under the floor mat, don’t lock the car. If possible, put a sign in the window- TOW TRUCK CALLED. If a car is simply abandoned on the side of the road, the police department will have it towed to one of their authorized facilities at your expense and storage charges may apply. 5) When the tow truck arrives, exit your vehicle safely. You cannot ride in the car while it is being towed. Remain a safe distance away from the vehicle so the tow operator has room to work efficiently. He/she will speak with you to finalize the arrangements and receive your payment.